The automotive industry embodies a range of sectors including: repair and maintenance; car rental and hiring; commercial vehicles; auto recyclers; towing services; fuel retailing; parts and tyre retailing; motor vehicle and motor vehicle parts manufacturing; exporting and wholesaling; motor vehicle retailing; marine; bicycle retailing; agricultural and mining machinery; and outdoor power equipment. The automotive industry accounts for 2.2 per cent of Australia’s GDP ($37.1 billion) and employs 379,365 people nationally, making it one of the most substantial and important industries to the Australian economy. Without an automotive industry, Australia stops. The majority of automotive businesses are small enterprises that require sound policies and meaningful reform to allow them to grow and employ more people. Rising energy costs, skills shortages, onerous red-tape, over-taxation and outdated workplace regulations are just some examples of issues working against the competitiveness and productivity of automotive businesses. The automotive industry is calling on the Federal Government to commit to serious policy reform across a range of areas to ensure that it is able to maintain the national vehicle fleet well into the future. Support to maintain the national fleet will strengthen consumer confidence, mobility and national productivity. The next Australian Government should develop an automotive industry blueprint, in consultation with industry, which would provide guidance and a policy framework for the automotive industry as it transitions into new technologies. Despite its economic significance, the automotive industry continues to struggle for appropriate recognition from government. The large-scale contribution of the industry to the Australian economy and the lives of every Australian demands that the industry be taken seriously by policymakers. This is particularly important as the industry makes the transition to new technologies over the coming years. The wider uptake of electric, connected and autonomous vehicles is expected to significantly disrupt the automotive industry’s structure and business models. This disruption will have implications for urban infrastructure, skill requirements and government revenue streams – all of which require forward planning and policy debate. As the automotive industry moves through this period of transition, it is critical that government details its policy intentions for the industry. The development of an automotive blueprint, as recommended by a Senate Economics Reference Committee report – The Future of Australia’s Automotive Industry, 1 December 2015 – would assist automotive businesses with their planning and development, as well as provide certainty and improved business confidence. VACC is well placed to be an active participant in the formulation of future automotive policy, leveraging the expertise from across our diverse membership and linkages to national and state- based automotive association networks. The next Australian Government should support and implement the ACCC’s recommendation for a mandated scheme for car manufacturers to share technical information with independent repairers on commercially fair and reasonable terms. Automotive service and repair professionals require access to up-to-date manufacturers’ service and repair information and software programming downloads. This ensures vehicles are repaired safely and in accordance with the manufacturers’ prescribed procedures. The automotive industry strongly supports the Australian Competition and Consumer Commission’s (ACCC) 2017 recommendation for a scheme that mandates access to repair information. This would require car manufacturers to share technical information with independent repairers on commercially fair and reasonable terms. The scheme must provide the same technical information made available by manufacturers to their authorised dealers and preferred repairer networks. This should include environmental, safety and security-related information, ensuring consumers have access to competitive, convenient, safety-focused service and repair information for the life of their motor vehicle. In accordance with recommendations 1.15 and 4.9 of the Royal Commission into Misconduct in the Banking, Superannuation and Financial Services Industry, the next Australian Government should empower ASIC to approve a nationally mandated Motor Vehicle Insurance and Repair Industry Code of Conduct, with enforceable provisions administered by ASIC. In accordance with measures proposed by the Royal Commission into Misconduct in the Banking, Superannuation and Financial Services Industry, the next Australian Government should review the effects of vertical and horizontal integration in the motor vehicle insurance and smash repair industries. There is confusion among car insurers and smash repairers as to the rights, responsibilities and obligations of parties under the Motor Vehicle Insurance and Repair Industry Code of Conduct (the Code). This is causing serious, systemic conflict at a national level. New South Wales (NSW) is the only state to have made the Code law (in May 2017). All car insurers and smash repairers in NSW are bound by the Code and its subsequent determination orders. In other states and territories, the Code is voluntary, so only those who have signed on to the Code are bound by it and its determination orders. In accordance with the findings of the Royal Commission into Misconduct in the Banking, Superannuation and Financial Services Industry (Royal Commission), VACC calls for ASIC to be empowered to approve and enforce a nationally mandated Code that is binding on all car insurers and smash repairers. This would improve its efficacy, reduce the threat of disputes, and stabilise a fragile smash repair industry. Consumers would also benefit, by including their right to receive transparent, fair and reasonable repair estimates, insurance assessment calculations and cash settlements. In recent years, the smash repair industry has suffered considerable dislocation and financial loss from insurance companies incorporating vehicle smash repair activities within their business operations. This has substantially reduced competition within the smash repair market. The next Australian Government should introduce an automotive-specific Franchise Code of Conduct. The state motor trade associations have long called for the immediate development and implementation of a specific, mandatory and enforced franchise code for the automotive industry. Automotive franchise dealers often report unfair and anti-competitive commercial behaviour by franchisors against smaller independent operators and franchisees. An example of unfair practices includes the drafting of anti-competitive business practices within franchise agreements, often blatantly disregarding the provisions of the national Franchise Code of Conduct. Automotive-specific franchise businesses also differ substantially from other types of franchises. Dealerships (of light and heavy vehicles and motorcycles), fuel retailers and car rental franchises typically require a large capital outlay and infrastructure set-up costs, which increase the financial risk taken on by the businesses. This risk is heightened when a franchise termination notice can be as little as three months and multi- brand sharing of a facility is forbidden. Specific performance, extension and termination clauses for automotive retail are urgently required. The introduction of such an automotive-specific Franchise Code of Conduct would allow for greater business certainty, reduced risk to employment and improve investment into franchises by franchisees. Promote the value of automotive apprenticeships to employers, job seekers, parents and students. Introduce improved support measures and incentives for employers to hire and retain automotive apprentices, including those from diverse and non-traditional backgrounds. Introduce meaningful industry-led VET advisory councils and KPIs to TAFE institutes to engage with industry. Introduce tighter enforcement of VET regulation. 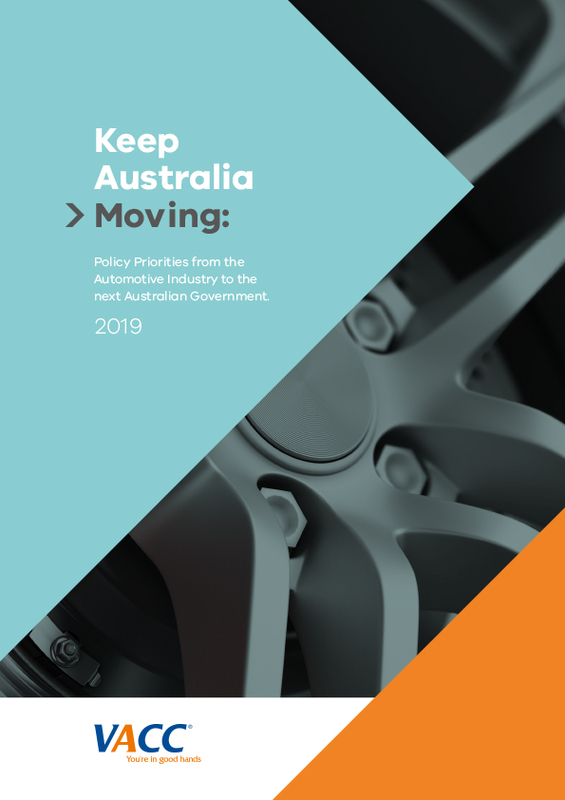 Make changes to Australia’s migration program to improve its accessibility and responsiveness to better meet skill and labour needs in the automotive industry. The Australian automotive industry is experiencing the most profound skills shortage in its history. National figures suggest the industry requires an additional 35,000 skilled workers. Skills shortages are affecting almost half of the industry, limiting business investment, employment, planning and growth. To combat this problem and prepare for the jobs of the future, the VACC makes the following recommendations. The automotive industry argues that raising the profile of automotive apprenticeships has flow- on benefits to improved commencement and completion rates for automotive apprentices. Job seekers and school leavers need quality careers advice, with a focus on the viability, transferability and respectability of an automotive trade career. This advice should include informing parents, teachers and other youth leaders who are the primary influencers in a student’s career choice. Automotive apprenticeships need to be promoted as a credible career path, with vibrant new technologies emerging such as hybrid, fully electric and autonomous vehicles. It is crucial that the right mix of incentives is offered to encourage the hiring and retention of apprentices; for example, female apprentices in non-traditional trades. The present system is based on incentives for businesses to hire specific candidates, usually those facing employment barriers. The automotive industry argues that the system should be broadened to encourage employers to engage across a much broader spectrum of canditates. This would improve retention rates and levels of employment diversity across the industry. Incentives should also be structured to encourage employers to retain and invest in their apprentices, as opposed to one-off payments for placement. The automotive industry is disappointed at the extent of its disconnect with the TAFE sector. The industry is calling for a skills framework that genuinely places industry at the centre of the national vocational education and training (VET) system. This should include a skills advisory council with the commensurate knowledge, affinity and understanding of the industry needed to inform the development of VET programs. This has often been outsourced to consultants who have a superficial understanding of the automotive industry, which subsequently affects the efficacy and quality of the training offered. It is essential the TAFE sector actively engages with industry. TAFE and industry engagement was higher two decades ago, but has been declining ever since. Industry argues that TAFE institutions should have key performance indicators (KPIs) associated with their level of engagement with industry. The role of the Australian Industry Skills Committee (AISC) appears to be largely irrelevant and cumbersome, with a focus on administration rather than strategic outcomes. It is imperative that the AISC is agile, truly reflective of industry and able to contribute to the development of genuine, industry- informed training. The auditing of registered training organisations (RTOs) against the relevant standards is inconsistent and unreliable. The automotive industry calls for more scrupulous enforcement of VET regulations, as the current approach of desktop auditing does little to properly inform policymakers of real training outcomes, which are often graduates who are ill- equipped for employment by automotive businesses. Industry argues for the use of industry-based subject matter experts to assist with onsite audits and provide up-to-date industry knowledge. This would also assist with reinforcing industry expectations on outcomes. Skills shortages continue to affect the automotive industry, necessitating the employment of skilled migrants. Migration is a positive contributor to the Australian economy, delivering a distinct comparative advantage through the mix of younger, skilled migrants, working holiday makers and students. However, the restriction of temporary skilled migrants in reaction to congestion and infrastructure fears is worrying. The industry requires access to a skilled labour pool to operate and grow its businesses. Further restrictions to this will have profound, negative economic repercussions. The automotive industry recommends that the Federal Government make changes to its migration program to improve its accessibility and responsiveness to better meet skill and labour needs. These changes should include access to all skilled occupations for employer-nominated migration, ensure visa fees and charges are internationally competitive, set the cap for permanent migration based on evidence of economic benefit, and improve the processing times and affordability of the program. Ensure payment for domestic violence leave does not become the responsibility of employers. Commit to a review of the Small Business Fair Dismissal Code and the procedural fairness process. Oppose the introduction of industrial manslaughter laws across Australian states and territories. Exclude group training organisations from any National Labour Hire Licensing Scheme. Australia has become a costly place for small businesses to hire, retain and manage staff. It is also one of the most heavily regulated labour markets in the world, consistently ranking poorly on flexibility and responsiveness when compared internationally. In order to assist businesses to grow and employ more staff, the automotive industry recommends the following industrial relations reforms. All employees (including part-time and casual employees) are now entitled to five days of unpaid family and domestic violence leave (FDVL) each year. The automotive industry understands the need for flexibility, together with empathy and understanding for domestic violence issues. However, it is industry’s position that the five days unpaid leave should not be converted to paid leave. The burden of many social-related issues falls on businesses – especially small businesses – that cannot pass on the increased financial costs to consumers. Employers have the delicate job of balancing the care and wellbeing of staff against financial obligations. Should government legislate that employers must pay an additional five days of FDVL, the total number of paid leave days available would rise to 54. This is a direct cost to the employer that will be a further disincentive to business development and growth. The Small Business Fair Dismissal Code (SBFDC) and the general procedural fairness framework used by the Fair Work Commission to determine whether a termination was harsh, unjust and/or unreasonable has failed to produce a fair and balanced approach to termination issues. Consequently, employers are showing a reluctance to employ staff. The present SBFDC is not considered to be effective or reliable by industry and should be reviewed. The automotive industry opposes the introduction of industrial manslaughter laws across all Australian states. Industrial manslaughter laws have recently been legislated in Queensland, making it the first Australian state to subject companies to new criminal offences of corporate manslaughter and negligently causing serious harm. Such offences include serious fines and impose criminal liability on individual directors and senior managers. To date, there is no evidence that increasing the severity of penalties corresponds or correlates with a reduction in workplace deaths and/or injury. Such a law will see a move towards expensive legal solutions rather than preventive strategies. The court system and WorkCover resources will be overburdened as defendants are more likely to contest these matters judicially. The automotive industry acknowledges that workplace safety is a serious issue. However, mandating harsher penalties, increasing regulation and threatening managers and directors with greater prison sentences than those that exist under health and safety legislation will not achieve the desired outcome, which is to change behaviours and eliminate dangerous practices. The proposed National Labour Hire Licensing Scheme (NLHLS) should exempt group training organisations (GTOs) – from its provisions. Apprenticeship programs, such as those delivered by motor trade associations across Australia, are already held accountable via national industry standards, with an independent audit process conducted by specific state and territory providers. GTOs do not have the same operating memorandum as a labour hire business and as such have been regulated efficiently through national GTO standards that shape GTO ethos. It is important to note employer association-led apprenticeship programs coordinate an essential link between business and youth in Australia. They also facilitate the development of the employment skills needed by industry to grow into the future. Additional regulation, by way of a NLHLS, is unnecessary, and burdensome. Develop a national program aimed at the proper disposal of end-of-life vehicles. Conduct a review into the structural issues that are preventing automotive recyclers and other industry sectors from accessing business insurance. Australia is the only developed country that does not have a national policy dealing with end-of-life vehicles (ELVs). Such a policy vacuum leaves the auto recycling sector vulnerable to rogue traders and environmental breaches. The emergence of illegal wreckers who operate outside the regulatory guidelines is a serious problem across all states and territories and has the capacity to make lawful vehicle recycling operations unviable. Effects of such practices include tax evasion and non-compliance with occupational health and safety and environmental protection laws. It is constantly reported that illegal operators provide components to the black market, supporting underground and often illegal operations. Landfill is also a serious concern for this sector. The variation in quality, quantity and consistency of plastics, along with the extent to which plastic is distributed throughout the vehicle, make it difficult to determine what is worth recycling. The recycling process is costly and plastic is in direct competition with other more valuable materials such as steel and aluminium. As a result, the majority of plastic recovered from vehicles is sent to landfill. Countries such as Germany, South Korea, Japan, the United Kingdom and Norway have implemented regulated ELV policies. They acknowledge that a sound ELV strategy is essential to good environmental and economic management. Such systems also contribute to meeting environmental obligations under international law. Recognising the environmental and economic concerns related to the disposal of ELVs, the automotive industry recommends that the Federal Government works towards a nationally implemented ELV plan. Finally, a lack of available business insurance (such as professional liability; property; workers’ compensation; product liability and business interruption insurance) for automotive recyclers and other automotive businesses has reached crisis point, with many businesses forced to trade without insurance. The next Federal Government should conduct a review into the structural issues obstructing businesses’ access to this essential cover. The next Australian Government should commit to supporting and facilitating public and private investment that will improve digital connectivity across regional and remote areas of Australia. Many regional businesses use digital technologies in a variety of ways to improve their productivity and generate higher profits. However, for many regional businesses, the quality and reliability of internet access services and mobile phone reception are substandard, limiting a business’s ability to fully utilise digital technologies to grow, employ staff and better service customers. Slow download times coupled with constant disruptions, drop-outs and outages make it almost impossible for regional businesses to rely on the network. There are also reports of poor mobile phone reception – only one bar out of four – in some regions. Such poor-quality reception limits effective communication between businesses and their customers, resulting in numerous missed calls, lost business and consumer dissatisfaction. Tractors, harvesters and other agricultural machinery are now interconnected via satellite services. Service and diagnostic capabilities, as well as GPS, are built into their systems, which communicate through 4G technology. The impact of poor quality and unreliable digital connectivity sees some businesses resorting to fixed cable in a bid to solve issues such as slow broadband speeds and irregularities in their wireless connection. Others have installed large antennas to fix problems with their satellite connections. More specifically, the cost of some digital technologies – such as the National Broadband Sky Muster satellite – is so prohibitive that they remain out of reach for many small businesses and it has affected their broader uptake. There is a strong argument that good mobile phone coverage is both an economic and business imperative, as well as a ‘social good’. Government needs to support and facilitate public and private investment to improve mobile phone coverage and provide reliable internet connectivity across regional Australia. The luxury car tax (LCT) was introduced in 2000 to encourage buyers to purchase locally manufactured vehicles instead of imported prestige vehicles. The end of passenger vehicle manufacturing in Australia now makes this tax redundant. LCT is charged at 33 per cent on the proportion of the vehicle priced over $66,331 (or $75,526 for vehicles categorised as ‘fuel efficient’). These thresholds are absurdly low and affect many working vehicles. This includes four-wheel-drive vehicles that meet the needs of rural consumers, such as the Mitsubishi Pajero, Toyota Land Cruiser and Nissan Patrol. They are all priced above the LCT threshold. These vehicles are essential for performing transport tasks on roads and in conditions that are often unsuitable for regular vehicles. This consequently penalises consumers in rural and regional communities, who are often the purchasers of such vehicles for work purposes. The automotive industry strongly believes that the LCT is unfair and discriminatory towards motor vehicle dealers and consumers. It acts to artificially inflate the price of vehicles that offer the latest in safety and emission technologies. There is gross inequity given traditional luxury items such as yachts and jewellery do not attract the same type of additional taxation. Use the Council of Australian Governments (COAG) to reduce red-tape and better align state-based legislation and regulation to improve business competitiveness and consumer certainty regarding the registration, repair and retailing of motor vehicles across Australia. Develop technical notes that would assist state-based adjudicators to make more consistent decisions when applying the Australian Consumer Law to motor vehicle faults and warranty issues. The retail sale, registration and repair of motor vehicles in Australia are made difficult by complex and inconsistent state-based legislation and regulation. Industry and consumers face confusing and varied red-tape requirements when acquiring, transferring, repairing or obtaining a roadworthy certificate in different jurisdictions. In the era of the digital marketplace, regulation related to the retail automotive industry should be simplified. This would create a level playing field across states and territories and reduce costs for consumers and automotive businesses. The next Australian Government should use COAG to identify areas for red-tape reduction and discuss opportunities to better align state-based legislation and regulation – improving business competitiveness and consumer certainty when registering, repairing or retailing a motor vehicle across Australia. There is also evidence of wide variability in the interpretation and application of Australian Consumer Law (ACL) by state-based Offices of Fair Trading (OFT). This inconsistency leads to unnecessary stress and financial imposts on both consumers and business. At present, there is no common standard for the interpretation of the ACL when applied to the complexities of motor vehicle retailing. To address this problem, VACC recommends the development of technical guidance notes to accompany specific provisions of the ACL that relate to motor vehicle retailing and repairs. This would facilitate a more consistent and fairer application of the ACL across state-based tribunals and courts.